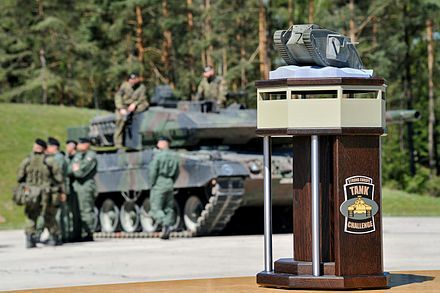 The SETC trophy, with a German Leopard 2A6 in the background. The Strong Europe Tank Challenge (SETC) is an annual, multinational tank crew competition hosted by the U.S. Army Europe and the German Army. Crews from NATO and non-NATO partners compete in defensive/offensive mounted and dismounted operations. The first challenge was held in 2016, with Germany taking first place. The 2017 challenge saw Austria placing first, with Germany and the U.S. taking second and third, respectively. The 2016 competition was the first SETC competition. Denmark, Germany, Italy, Poland, Slovenia and the sent one platoon, the United States sent two. The Czech Republic planned to send a platoon, but the unit failed to arrive. The second annual competition included two newcomers, Ukraine and France. Italy and Slovenia did not appear, and Denmark could not afford to attend. ↑ "Strong Europe Tank Challenge | U.S. Army in Europe" (in en). http://www.eur.army.mil/tankchallenge/. ↑ "Germany wins big at 2016 Strong Europe Tank Challenge". Stars and Stripes. https://www.stripes.com/news/germany-wins-big-at-2016-strong-europe-tank-challenge-1.409391#.WS3-IGjyuUk. ↑ "Austria takes top honors in Strong Europe Tank Challenge" (in en). www.army.mil. https://www.army.mil/article/187584/austria_takes_top_honors_in_strong_europe_tank_challenge. ↑ "Strong Europe Tank Challenge 2016: Germany claims the Trophy". 22 May 2016. https://below-the-turret-ring.blogspot.de/2016/05/strong-europe-tank-challenge-2016_22.html. ↑ "Watch the Strong Europe Tank Challenge, See How U.S. Scored". 14 May 2017. https://www.sofmag.com/watch-the-strong-europe-tank-challenge-see-how-u-s-scored/.